The start of the new year is also the beginning of a new series of blog posts about experimenting with materials for Melanie with her new series: Response Saturdays. Tammy Powley has a new book out and Jean has the info on it! It looks like it will be a MUST for everyone's jewelry design library! This week's installment of Thursday Giveaway includes some luscious, turquoise-colored stone beads from Auntie's Beads! Find out how you can win them! Do you ever use Swarovski Prisms in your jewelry pieces? Stop by A Bead A Day to share your experiences! Get all your jewelry supplies and other crafting goodies organized with these great tips. 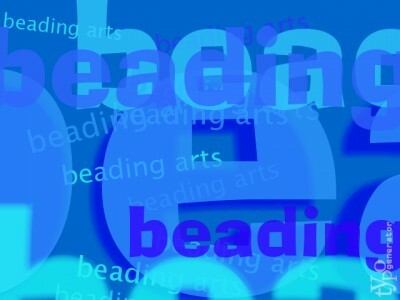 The Art Bead Scene reviews the monthly challenge winners for 2010. Would you like to attract more readers for your blog or more customers for your online shop? Michelle shares 5 tips for getting started with SEO, search engine optimization. Carmi creates a focal piece from chandelier glass. It's time for Cindy's Annual Studio Sale or the Saga of the Neverending Beads!